Home » Health » What Is Gastric Ulcer? Gastric Ulcers ( Peptic Ulcer ) are injuries that appear on the stomach wall due to erosion of the lining of the stomach wall. This wound also has the potential to appear on the wall of the first portion of the small intestine ( duodenum ) and esophagus. Gastric ulcers can cause pain in the stomach or even bleeding in severe cases. This disease can affect everyone at any age. Even so, men aged over 60 years have a higher risk to experience it. Gastric ulcers can be treated thoroughly if the underlying cause is known. Spread to the neck, navel, to the back. Feels worse on an empty stomach. Generally reduced for a while if you eat or take acid-lowering drugs. Missing then relapse a few days or weeks later. In addition to pain in the stomach, there are some other symptoms you may experience, among which are heartburn , no appetite, nausea, and indigestion. If you feel any of these symptoms, consult your doctor. However, peptic ulcers sometimes cause no symptoms until complications occur. Therefore, you should be alert and immediately to the hospital for emergency treatment, especially if you have vomiting blood , stools with blood or black, and stomach pains that appear suddenly and continue to grow worse. These symptoms indicate bleeding in the stomach. The stomach wall is usually coated with a mucous membrane that protects it from stomach acid. Increased levels of stomach acid or thinning of the gastric membrane may potentially lead to the appearance of a gastric ulcer. Common causes that can decrease gastric wall protection against stomach acid include bacterial infection of H elicobacter pylori and use of non-steroidal anti-inflammatory drugs. Ibuprofen , aspirin, or diclofenac are some examples of the commonly used non-steroidal anti-inflammatory drugs. In addition, pancreatic tumor disease (gastrinoma) and radiation treatment in the stomach area can also cause peptic ulcers. Infection due to H. pylori bacteria is a common condition and is often unknown to the sufferer. While frequent or prolonged consumption of steroidal anti-inflammatory drugs increases the risk of gastric ulcers, especially for the elderly. Consume alcoholic beverages that can dilute the protective wall of the stomach wall. Experiencing stress that is not addressed immediately. Smoking increases the risk of stomach ulcers for people infected with pylori bacteria. Many consider spicy foods or stressful conditions as the cause of peptic ulcers. This assumption is incorrect. Food and stress do not cause stomach ulcers, but can aggravate the symptoms. In the early stages of diagnosis, your doctor will ask you for symptoms. If suspected of having a peptic ulcer, you will be advised to undergo a more detailed examination. Follow-up examinations include gastrocopy (endoscopy), radiological examination (X-ray or CT scan ), and examination to confirm the presence of H. pylori bacteria . If doctors suspect that stomach ulcers arise from bacteria and patients never take nonsteroidal antiinflammatory drugs, bacterial examination is likely to be done through blood tests, stool examinations, or breathing tests. Gastroscopy (endoscopy) is also done by inserting the camera into the stomach. This process will help the doctor examine and ensure the existence of injuries on the stomach wall directly. In addition to gastroscopy, advanced examination with X-rays or CT scans that give the image of the esophagus (esophagus), stomach, and small intestine can complete the diagnosis. Sometimes this is done by asking the patient to swallow a fluid containing barium so that the resulting image looks more clear. 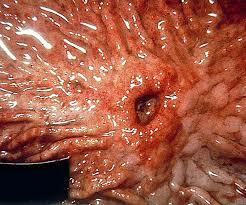 If gastric ulcers are found, tissue sampling of the stomach is also done in the endoscope. The sample will then be tested to detect the presence of H. pylor i bacteria. Step treatment for each patient is not the same. Doctors determine it based on the causes of peptic ulcers experienced by the patient. The ultimate goal of gastric ulcer treatment is to destroy H. pylori bacteria and reduce the consumption of nonsteroidal anti-inflammatory drugs (NSAIDs). Handling of peptic ulcers is also assisted by the provision of drugs. Antibiotics . Gastric ulcers caused by H. pylori bacteria will be treated with a combination of several antibiotics. Amoxicillin ,, metronidazole and clarithromycin are examples of antibiotics usually prescribed by doctors. Patients will be reexamined to see the presence of H. pylori bacteria four weeks after treatment with this combination of antibiotics is complete. If the bacteria is still left, then the doctor will give different antibiotics to complete the treatment. Proton pump inhibitor . If you have a gastric ulcer caused by a non-steroidal anti-inflammatory drug, your doctor will recommend the use of a proton pump inhibitor. This drug will reduce the acid levels of the stomach by blocking the performance of cells that produce stomach acid. Lansoprazole omeprazole , and pantoprazole are the most common types of proton pump inhibitors. Use of these drugs can give side effects are usually mild, such as dizziness, diarrhea, or constipation, and abdominal pain. However, these side effects will disappear once treatment is stopped. These drugs are usually given for four to eight weeks. H2 receptor inhibitor . The function of this drug is the same as the proton pump inhibitor, which is lowering the acid levels of the stomach. This drug can overcome the stomach ulcers and accelerate healing. The usual drug is ranitidine . Antacids and alginates . Antacids will neutralize the stomach acid for a short time, while the alginate will protect the stomach wall. Therefore, both drugs are given to relieve pain quickly before other drugs begin to work. However, generally antacids are not used to treat gastric ulcers. For its use, antacids should be consumed after meals. But if you use a proton pump resin or ranitidine, you should wait 1-2 hours before taking antacids and alginates, because it can cause side effects such as flatulence, diarrhea, and vomiting. Bananas can also be consumed as an alternative if you are reluctant to use both drugs. Drugs that protect the walls of the stomach and small intestine. These cytoprotective drugs are sucralfat and misoprostol. In addition to medication, surgery is also sometimes necessary if a gastric ulcer has resulted in a hole in the wall of the stomach or if there is serious bleeding that can not be overcome by the action through the endoscope. Limit alcohol consumption. Alcohol content can cause irritation in the stomach that has inflammation. Quit smoking. Cigarettes can inhibit healing while increasing the risk of stomach ulcers. Reduce consumption of tea and coffee as both can increase the acid levels of the stomach. Reduce consumption of milk. Sometimes, eating milk can help relieve the pain caused by a stomach ulcer. But after that, milk will increase the acidity of the stomach, so the stomach will increase pain. Eating foods containing probiotics, such as yogurt, old cheeses. Avoid consumption of spicy or fatty foods. Apply a healthy diet with lots of fruits, vegetables and whole grains. Replace the commonly used painkillers if possible, and check with the appropriate doctor for you. Controlling stress and getting enough rest. For gastric ulcer patients caused by non-steroidal anti-inflammatory drugs, you should avoid or be aware of these drugs in the future. If your health condition requires you to keep using it, discuss the best methods of application with your doctor to avoid the risk of a peptic ulcer. Bleeding in the stomach . This is the most common complication of peptic ulcers. The volume of bleeding can be mild or severe to require blood transfusion. Mild bleeding leads to anemia so the face becomes pale, tired, and heart pounding. Peritonitis . Although rare, gastric ulcers potentially pierce the walls of the stomach or intestines and cause serious infections in the abdominal cavity. This complication requires emergency treatment at the hospital as it can be fatal if left unchecked. Impeded movement of food in the digestive system . Gastric ulcers can sometimes swell or form scar tissue that can clog the digestive tract so that food can not pass. Complications will trigger symptoms of rapid satiety, vomiting, and weight loss. Operating procedures may be needed to handle scar tissue that is formed. Stomach cancer. Although the association is still a debate, it is estimated that about 2% of gastric ulcer events can develop into gastric cancer . H. pylori bacteria are suspected to be the main pathogen of this complication. H. pylori infection can cause chronic inflammation that can increase the risk of stomach cancer significantly. Patients' age as well as the use of non-steroidal anti-inflammatory drugs will affect a person's risk for complications of peptic ulcers. Elderly with a male gender above 60 years is a sufferer of gastric ulcers who have the highest risk of complications. So also with peptic ulcers due to the consumption of non-steroidal anti-inflammatory drugs. Complications of this type often do not show symptoms so that they are unconscious and can not be treated until they are advanced and cause complications. Maintain personal hygiene from the spread of Helicobacter pylori bacteria that generally live in the mucus layer in the gastric protective tissue. This spread may occur through direct contact with the patient or through food and drink. Be cautious in the use of non-steroidal anti-inflammatory drugs. 0 Response to "What Is Gastric Ulcer?"